Treadmills are the most popular piece of home fitness equipment, even more popular than exercise bikes. Serious runners can use a treadmill to train when it's raining or too hot or cold outside. Yes, treadmills can be expensive, but so is a stay in the coronary care unit! Another way to think about the cost is that having your own treadmill may mean you don't have to join a gym to run on one. Also, don't think that you must run on a treadmill to get your money's worth. Walking is clearly an effective way to improve your health. Owning a treadmill will allow you to maintain your walking routine when the weather isn't optimum. • How much money do you want to spend? Treadmills range in price from $500 to $15,000. So, the old saying, "you get what you pay for," applies here. Treadmills take a beating. While it may be tempting to take advantage of a good deal, an inferior piece of equipment won't be as sturdy, dependable, or enjoyable to use. Consider the purchase an investment in your health: for example, how much are you currently spending on blood pressure drugs, cholesterol drugs, visits to the doctor, etc? 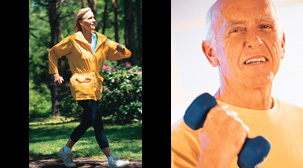 Regular exercise may reduce your health care expenses. • Who's going to use the treadmill? The size and weight of the user, as well as how he or she plans to use it (eg., training for a marathon, or, just daily walking for health) can make a difference in the kind of treadmill you purchase. How many people will be using it? 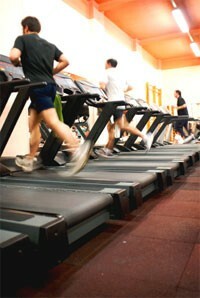 A treadmill's durability becomes increasingly important if several people will be logging time and miles on it. • Where will you keep the treadmill? Ask yourself if you want to watch the TV or look out of a window while using it. Shopping for a home treadmill is like shopping for a sofa; figure out in advance where you plan to use it and measure the space. You want to be sure your treadmill will fit where you plan to exercise. Folding types are more convenient, but less durable and may have a shorter running surface. • Will you really use it? According to Fitness Management magazine, 80% of home exercise equipment is not used after the first year. Treadmills are expensive, especially if they don't get used. On the other hand, this can work in your favor: you might find a used one in the classified ads that is like new. 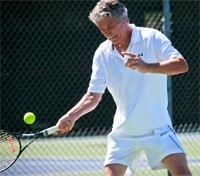 • Visit an authorized specialty fitness equipment store. You'll find higher quality products and greater selection at shops that specialize in fitness equipment such as Omni Fitness and L.A. Gym, rather than at general sporting goods stores or department stores. Also, specialty stores sometimes have certified fitness professionals who can help with selecting, understanding the features of, and maintaining your treadmill. • Try out several treadmills. Test different models of treadmills before making your final choice. If the machine doesn't feel comfortable to you, you won't use it, so bring your running shoes and plan to test each machine for several minutes. Look for sturdy construction features such as a wide and flexible running surface, an easy-to-read console and a variety of programming options, including those that let you get going quickly or that let you customize and personalize your workouts. • Check out the exercise programs. While most treadmills have adjustable inclines and speed settings, the range of programming options run the gamut from basic fat burning and cardio workouts to far more elaborate programming. • Evaluate the width and length of the belt. Make sure the handrails are far enough apart so your arms can swing freely when running. However, the belt should not be so wide that you have trouble straddling it when you stand on the side rails. Belts typically range 20 - 22 inches in width. Also, if you have long legs, make sure the running platform is not too short for your stride. The running platform typically ranges 55 - 60 inches. A running deck of 22x60 is considered "huge". • How powerful is the motor? If you don't weigh very much and are only going to use the treadmill for walking, a 2 - 3 hp motor will suffice. However, if you weigh 200 pounds or more and are going to run on your treadmill every week, then opt for a 3 - 4 hp motor. • Investigate the warranty. Don't forget to ask about warranties on parts and service. Because sitting all day is now recognized as a serious health risk, it is no longer a crazy idea to walk on a treadmill while you work. In fact, a variety of exercise products have been developed for office workers. We feature some of them here: Office Exercise Gear. • Noise is a factor: If you're going to talk on the phone while walking, then you want a quiet treadmill. The LifeSpan was quieter than the Exerpeutic. • Features/ergonomics: The Exerpeutic offered more features (programs, handrails with buttons to control speed and incline), but testers felt more stable on the LifeSpan and liked its wrist-pad better. The desk height was adjustable on the LifeSpan but not on the Exerpeutic. • Space/size: The Exerpeutic's desk and walking surface fold-up for storage, but it also had a shorter belt which testers didn't like. • For beginning runners: For several years in a row, Consumer Reports has ranked the Landice L7 Cardio Trainer and the Precor 9.31 as their top picks for nonfolding models. But these units are not cheap; both are roughly $4000. Beginning runners may want to think twice about spending a lot of money on a treadmill until certain if running is something they plan to do regularly. The ProForm Pro 2000 ($1999) was a top pick by several of the web sites that review treadmills. • Best folding treadmills: For treadmills that fold up, Consumer Reports has repeatedly selected the ProForm Pro 2000 and the Spirit XT485 as their top picks. • For heavy runners, multiple users, or daily usage: If the runner is heavy (ie., above 200 lbs), or, if the treadmill is going to rack up a lot of use, then, obviously, go for a more heavy-duty model. The Landice L7 Pro Sports Trainer ($3000) was named the best choice for heavy runners and pros by both Consumer Reports and the web site www.TreadmillDoctor.com. • For walkers: If you're certain you're only going to use the treadmill for walking, then it doesn't have to be a heavy-duty model. Consider a fold-up model. Often, these have a shorter platform (walking/running deck) which is less of a concern when walking as opposed to running. The Treadmill Doctor likes the Horizon T-101 by JohnsonFit for lightweight walkers. 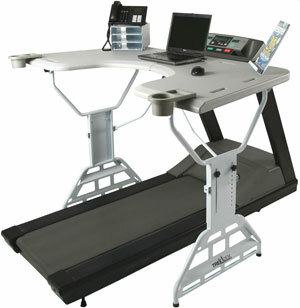 • For your office: If you have a desk job (and have the space), you might want to consider a desk treadmill. The winner in the Consumer Reports comparison of desk treadmills described above? The LifeSpan, even though it costs twice as much. But that comparison was done in 2013. The Treadmill Doctor selected the NordicTrack Desk Treadmill Platinum as their top pick for best desk treadmill of 2017. SmartReview.com describes LifeSpan as the leader in treadmill desks. • Read the reviews: Do your homework before buying. Treadmills come in a variety of models and the price range is wide. • Try them out: Run on several different models before making a decision. • Warranty and service: Don't forget to consider the warranty and how/where you can get service. Once your treadmill is in place, resolve to use it regularly. Don't let it become a clothes rack! Q: How accurate are the "elapsed distance" and "calories burned" values that treadmills display? ANSWER: The elapsed distance reading should be fairly accurate since, hopefully, the treadmill's computer is using the belt length in the calculation. But, the calories burned value is probably not very accurate. To properly determine calories burned, how much the person weighs and his/her age need to be included in the calculation. Q: Do you burn the same calories running on a treadmill as you do running outdoors at the same pace? ANSWER: In a word, no. You burn fewer calories running on a treadmill. There are several reasons: When you run on a treadmill, you are (a) not fighting any wind resistance, and (b) not actually "pushing" your body forward. A study published September 2017 revealed that the metabolic costs of running on a treadmill were roughly 6% less than running on a track at the same intensity. These researchers found that running 15% faster on a treadmill came close to matching the oxygen costs of running outdoors (Panasci M, et al. 2017). A 1996 study provides a bit more detail: Researchers found that at slower running speeds (6.5 - 7.4 mph), running on a treadmill and running outdoors were equivalent in terms of oxygen demands. However, at speeds of 8.4 mph and above, outdoor running required more effort than running on a treadmill at that same pace. They also determined that, at these faster speeds, adding a 1% incline to treadmill running would equate to outdoor running (Jones AM, et al. 1996). Because it requires less effort than running on roads or sidewalks, even I enjoy running on a treadmill. And that's saying something because I don't like road running any more! DISCLOSURE: Neither the author, nor AthleteInMe LLC, has any financial relationship with any of the products or manufacturers mentioned in this review.